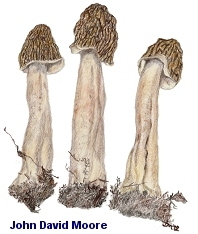 Verpa bohemica is mistakenly called the "early morel" in some areas. It appears very early in the spring, and continues fruiting during the true morel season. 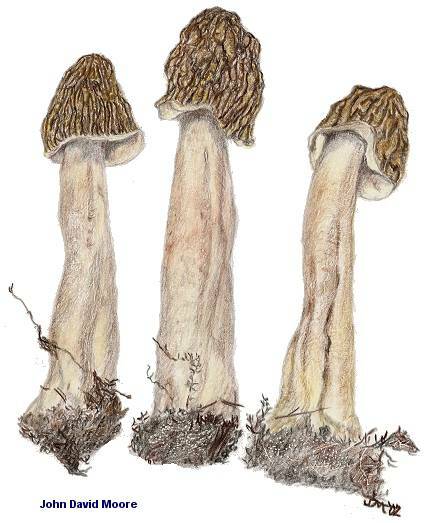 It bears a resemblance to the half-free morels, Morchella populiphila and Morchella punctipes, but the half-free morels are exactly that--half-free--while Verpa bohemica has a cap that hangs completely free of the stem, attached only at the top. Another way to separate the two mushrooms is to cut them open; the half-free morels are hollow, while Verpa bohemica usually has cotton-candy-like wisps of flesh inside. On close inspection, the verpa has a cap that is (usually) different, as well; it tends to look wrinkled, rather than pitted (though old specimens can develop a decidedly "pitted" look). Ptychoverpa bohemica is a synonym. Ecology: Probably mycorrhizal; found under hardwoods (and sometimes under conifers) in early spring; widely distributed throughout northern North America. Cap: 1-5 cm; nearly conical or irregular to bell shaped; wrinkled longitudinally, occasionally appearing pitted; tan to brown to dark yellow brown; underside pale. Stem: 6-15 cm long; 0.5-3 cm thick; more or less equal; sometimes tapered upwards or downwards; creamy white, sometimes tinged with brown shades, frequently with darker granules forming belts of color. Flesh: Thin; the cap and stem are hollow, or loosely stuffed with wispy fibers (like cotton candy) in the stem. Microscopic Features: Spores 45-87 x 15-22 µ; smooth; elongated-elliptical; sometimes slightly curved; without oil droplets. Asci 2-spored. Paraphyses cylindric; septate; 5-8 µ wide; with rounded apices. REFERENCES: (Krombholz, 1828) Schroeter, 1893. (Saccardo, 1889; Smith, Smith & Weber, 1981; Breitenbach & Kränzlin, 1984; Arora, 1986; Phillips, 1991/2005; Lincoff, 1992; Weber, 1995; Barron, 1999; Kuo, 2005; McNeil, 2006; Miller & Miller, 2006; Trudell & Ammirati, 2009.) Herb. Kuo 05249702, 05110305, 05090602.